I loved the images from Kingdom hearts. Sephiroth steals Aerith from under Cloud's nose. Aerith knew of her sacrifice always, and never told the party of it. Even now shes is slowly embracing Sephiroths sword as cloud's heaven will soon come smashing down as hell itself sneaks behind and takes his heart. Wowies, great wallpaper!! I love the effects that you used, the squares are something not a lot of people use ^_~. You did a great job with the background, looks really great and matchs really well with the scan. The extraction is also really good! Hmmm, the wings coming out of Aerith's back is a little random, you should take it off. 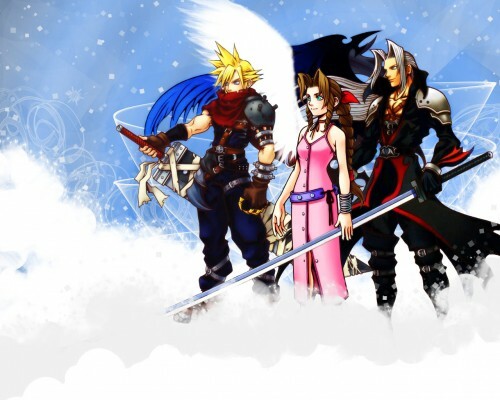 Anyway, Aerith was in Kindom Hearts?? (<-- never played the game >.<) But anyway, great job with this! !Great job!!!fav!!! Sweet wallpaper! This just reminds me, I still gotta get Kingdom Hearts 2. What a great pose; it's quite clean. I agree with darkwaterbunny; the wings are a little irrelevant, but this is otherwise a great wallpaper. Great job. Most of my favourite FF7 characters, all in their Kingdom Hearts guise. Roll on KH2 in the UK, I can't wait. great JOB! HAHA BUT I never liked aeris wouldnt IT BE COOL IF THEY PUT TIFA IN kingdomhearts 2? THAT would awesome! LOL THEY should PUT other FF CH IN kingdomherats AND SORA GETS TO USE 2 keyblades I think I SAW IT IN apicture SORA weilding 2 keyblades ISNT THAT awesome! auron GETS TO BE IN UR party too! Almost look like the three of them are a team. I really like the wing that was put on Aerith. She should be careful, she is about to cut her hand. yeaaahh... how come everybody's got wings all of a sudden?? oh hey splendid! i think they are the best character from FF.